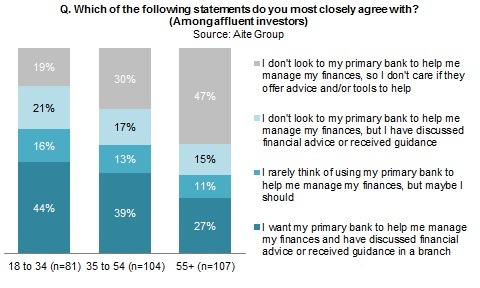 Banks should pay attention to young affluent customers when prioritizing wealth management channel investments. Boston, December 10, 2015 – Banks compete with a range of nonbank wealth management firms for their clients’ investment assets. Canadian banks hold around half of their customers’ investment assets and are well-positioned to grow this share of wallet and acquire new customers among affluent Generation X and Generation Y investors. Young affluent investors are more open to investing and seeking financial advice from their primary banks than are older affluent investors, but how can banks address the multichannel expectations of these demanding next-generation investors? This report analyzes how Canadian investors use digital, call center, and branch channels to manage their investments and plan their financial futures. It is based on a 2015 Aite Group survey, supported by Capco, of 1,246 Canadian online banking customers, including 632 online users who own investments. It is the third in a series on Canadian consumers’ banking preferences—find the first two here and here. This 23-page Impact Note contains 15 figures and one table. Clients of Aite Group’s Wealth Management service can download this report.